Fallen sequoia along the bank of the South Fork of the Middle Fork of the Tule River. 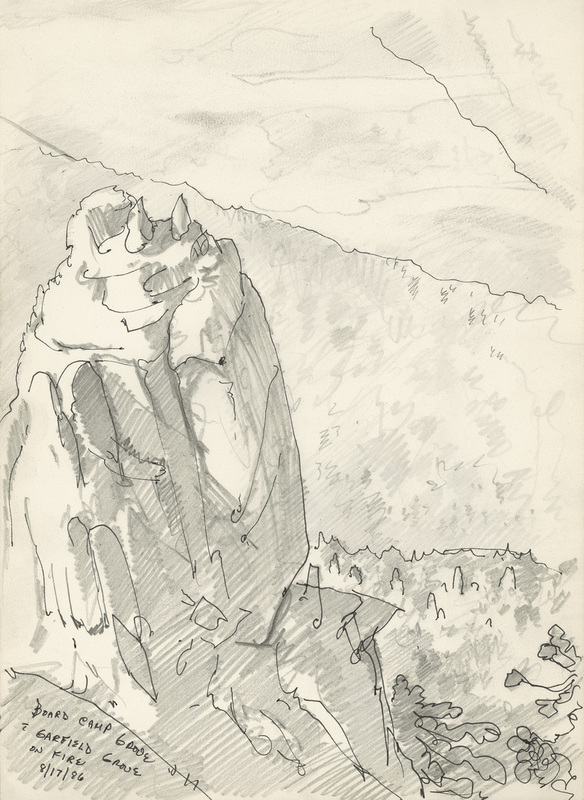 Pencil on newsprint, 9 x 12 inches, 1980. 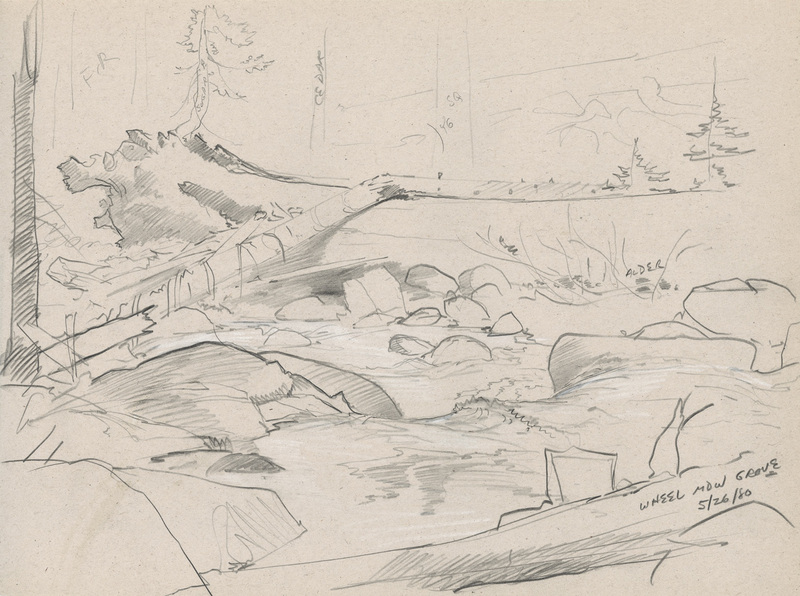 A fallen sequoia above the banks of Alder Creek. 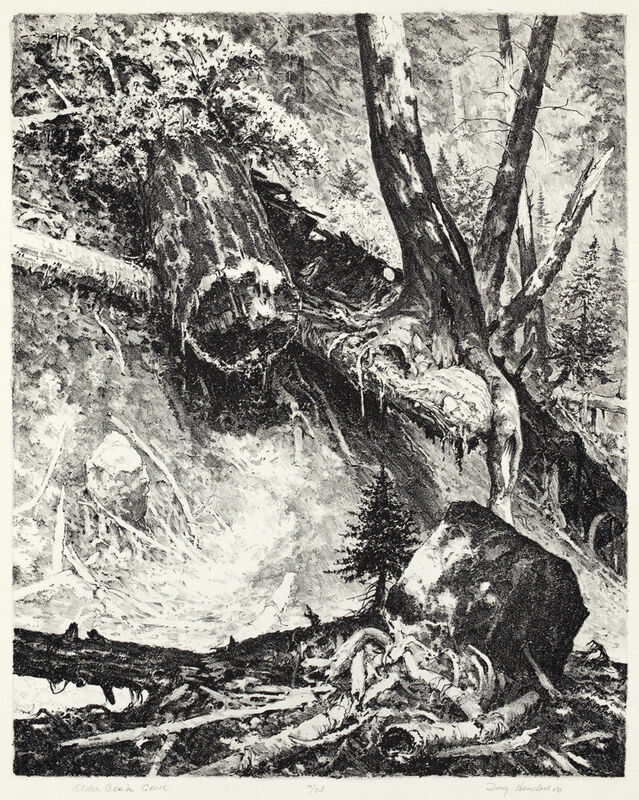 A fallen, broken sequoia trunk above cascades of Deer Creek. 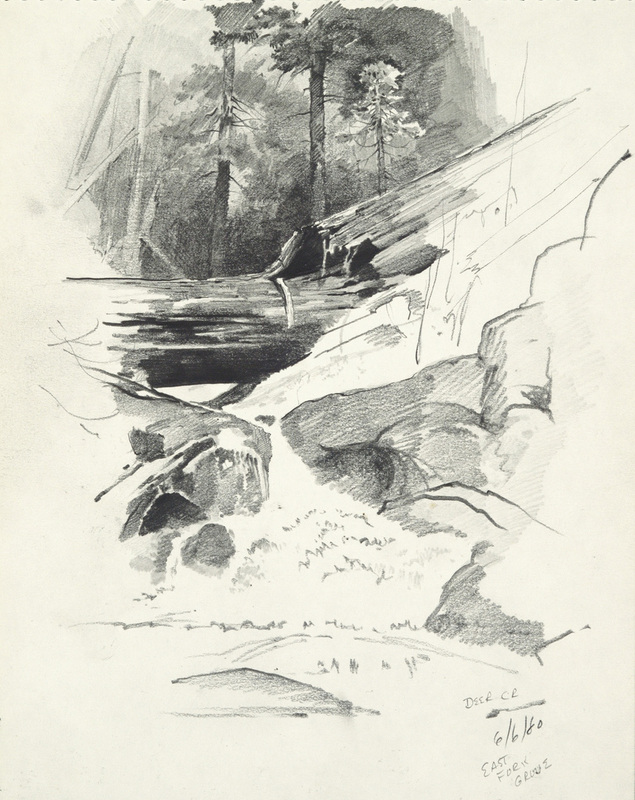 Pencil on paper, 9x12 inches, 1980. Finished print based on a field sketch of trees in Packsaddle Grove. Lithograph on Arches Cover, 1980. 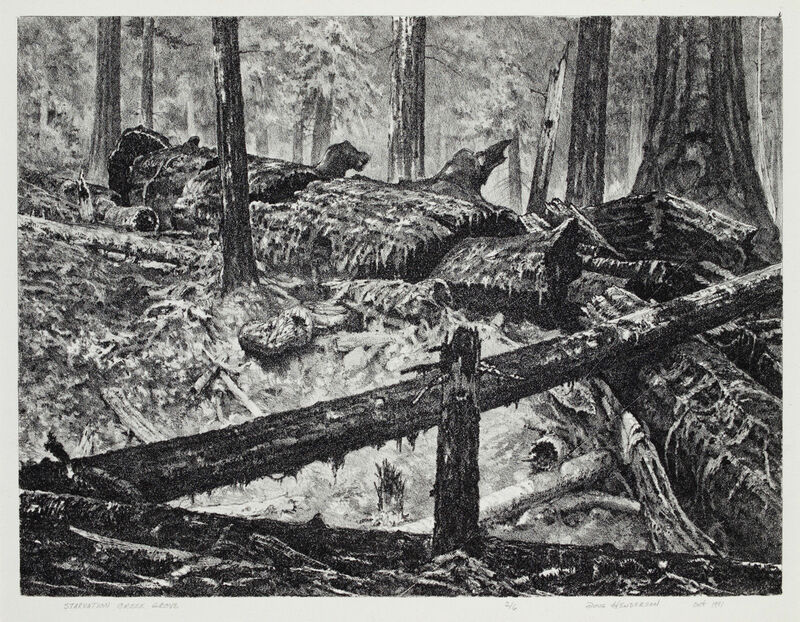 Finished print based on a field sketch of a fallen sequoia above Alder Creek. 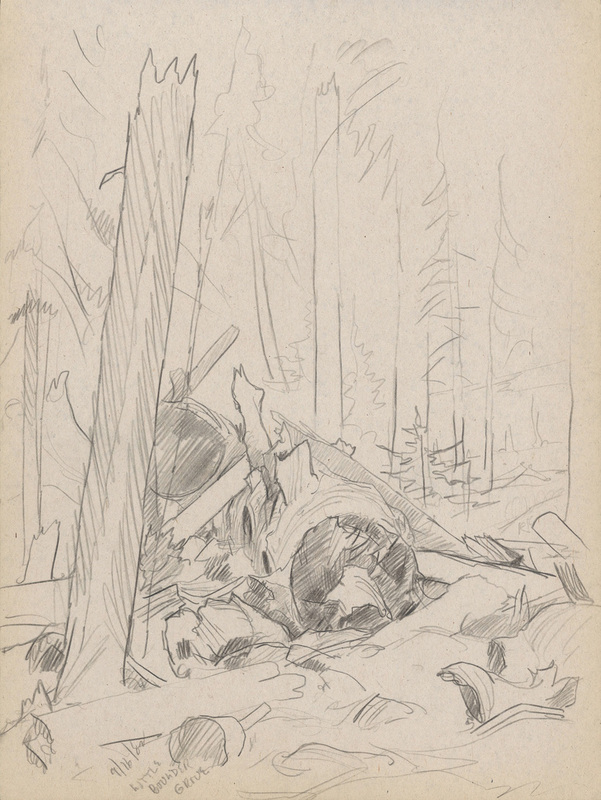 Finished print based on a field sketch of a fallen sequoia, broken into blocks like shattered glass, in Starvation Creek Grove. 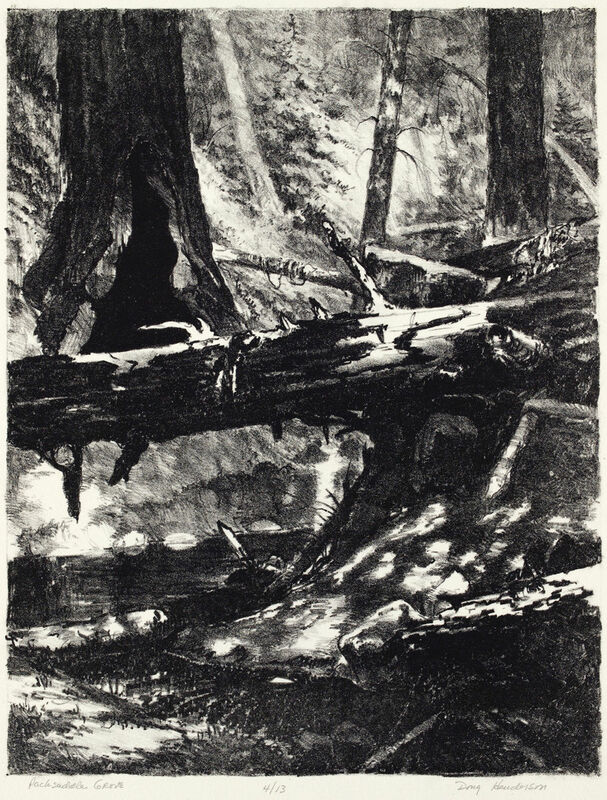 Lithograph on Arches Cover, 9 x 12 inches, 1981. Sequoia in Deer Meadow Grove, with granite spire beyond. 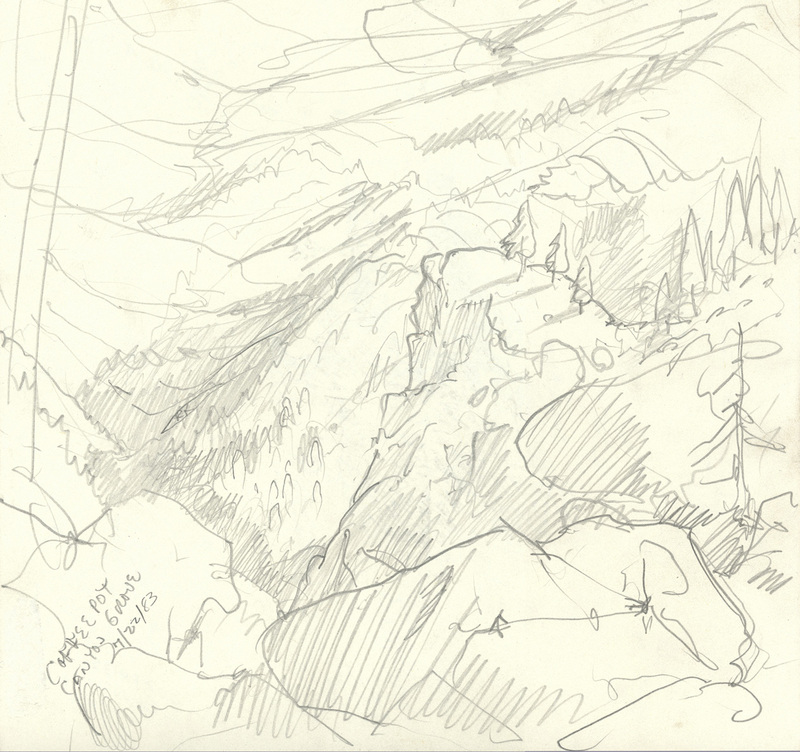 Pencil on newsprint, 9 x 12 inches, 1982. Shattered sequoia in Little Boulder Grove in Sequoia National Forest. Light on fallen sequoia in Kennedy Grove in Sequoia National Forest. 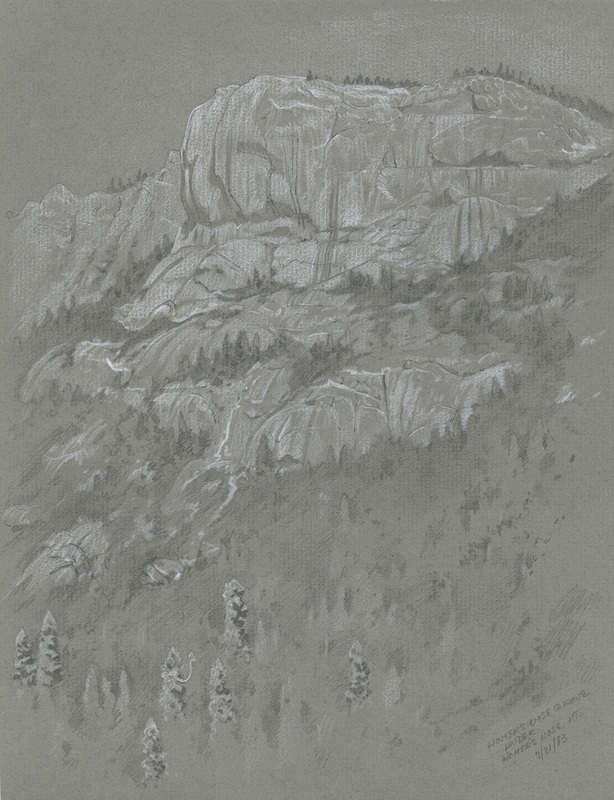 Pencil and white chalk on newsprint, 9 x 12 inches, 1982. Granite outcrops and sequoia crown in Burton Grove, Sequoia National Forest. Salvaged fallen sequoia along old Hume railroad bed in Windy Gulch Grove, Sequoia National Forest. 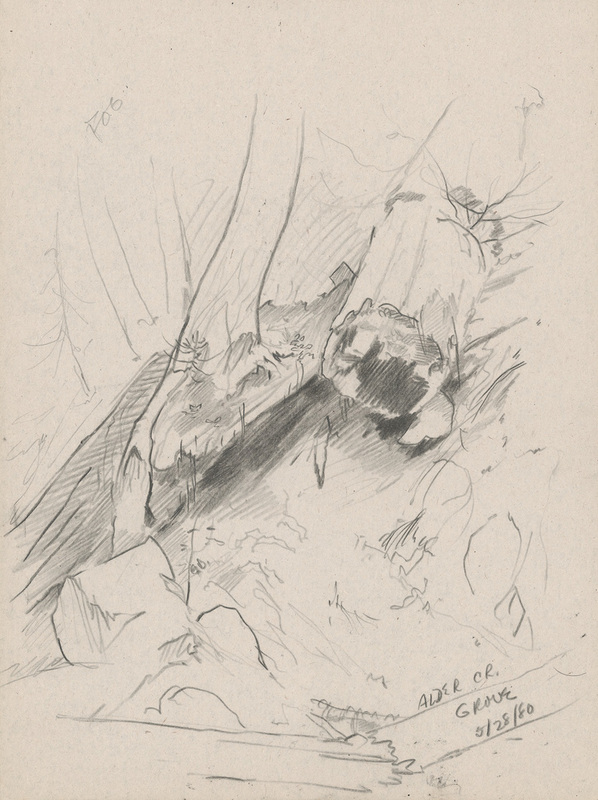 A cluster of sequoia in low light in Landslide Grove, Sequoia National Forest. A skyline of sequoia crowns in Redwood Mountain Grove with Sierra foothills and central valley beyond. 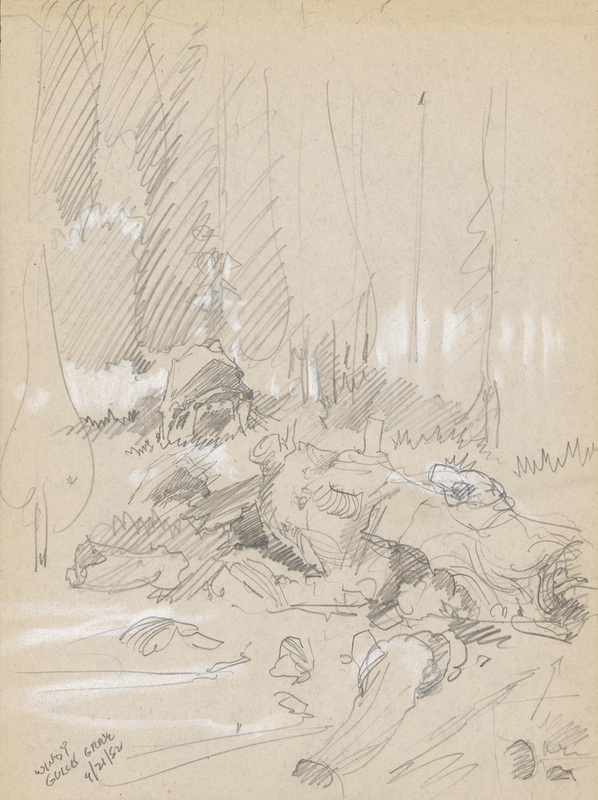 Pencil and white Prisma on toned pastel paper, 8.25 x 11 inches, 1982. 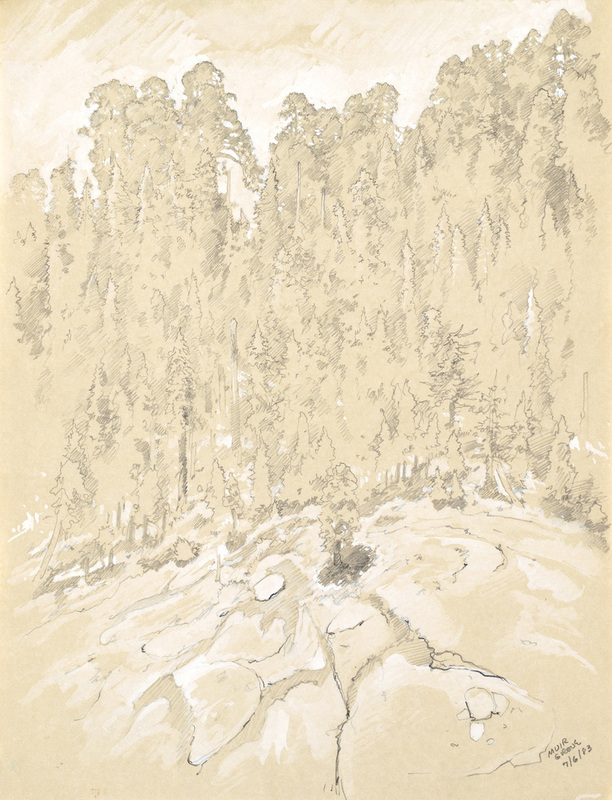 A finished lithograph based on a field sketch of sequoia along East Fork of the Kaweah River. 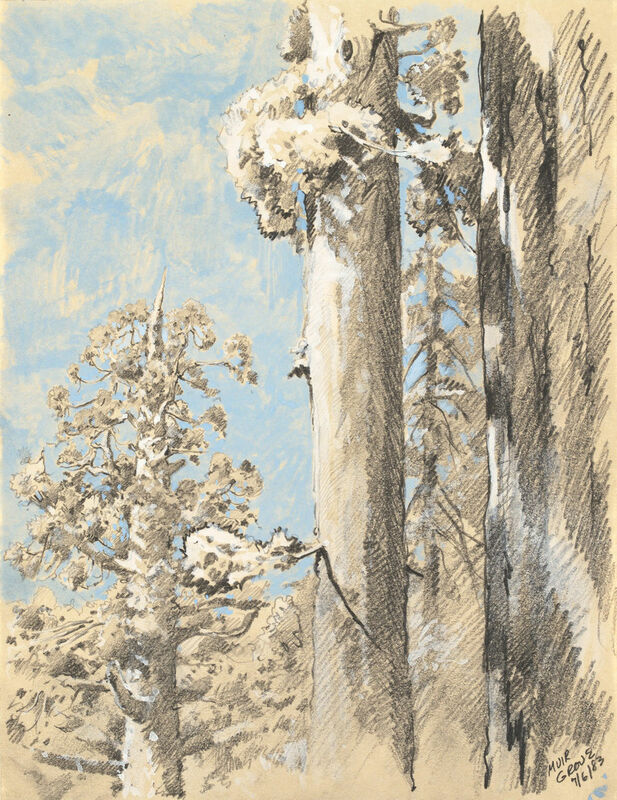 Lithograph tinted with watercolor on Arches Cover, 9 x 14 inches, 1982. Sequoia along an old road in North Grove above Sequoia Lake, a group of trees on the margins of Grants Grove. Pencil and white ink on toned calligraphy paper, 8.375 x 11 inches, 1983. Skyline of large Sequoia, including the General Grant Tree in General Grant Grove. Pencil and white ink on toned calligraphy paper, 8.5 x 11 inches, 1983. 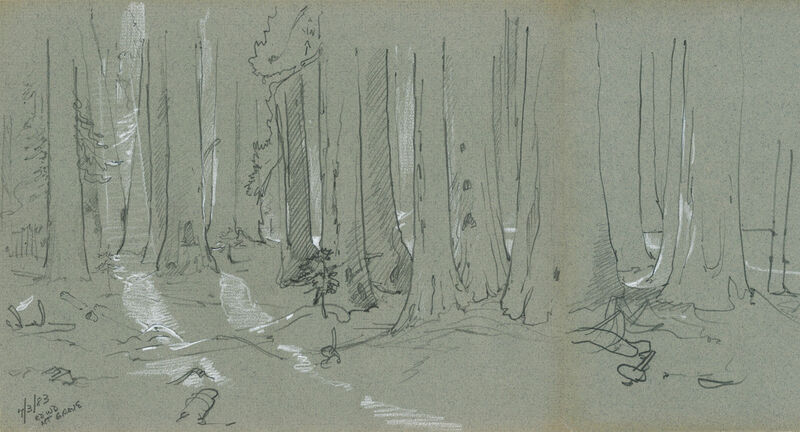 Late-day light falling across forest floor in pure stand of sequoia, Redwood Mountan Grove. Drawn on both sides of paper and here digitally joined together. 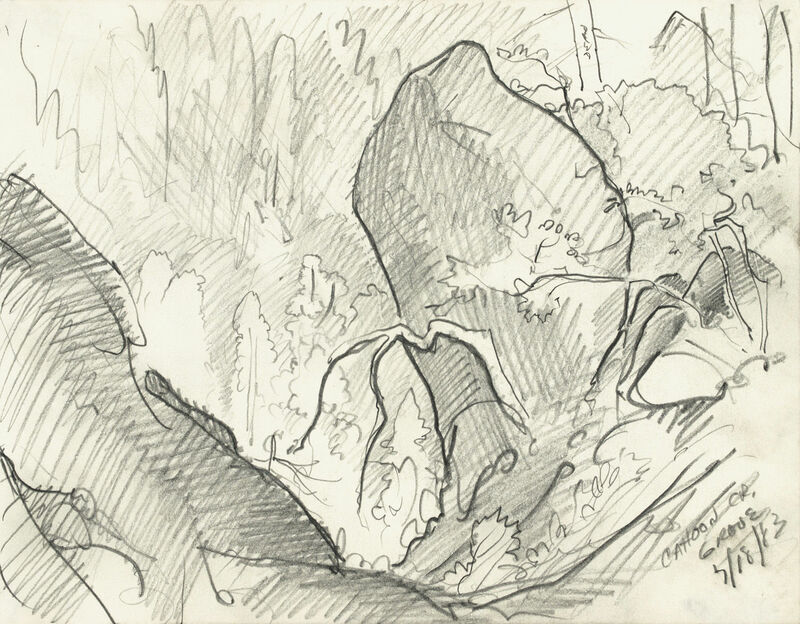 Pencil and white Prisma on toned pastel paper, 1983. Muir Grove on granite bluffs above Sierra foothills viewed across Dorst Creek. 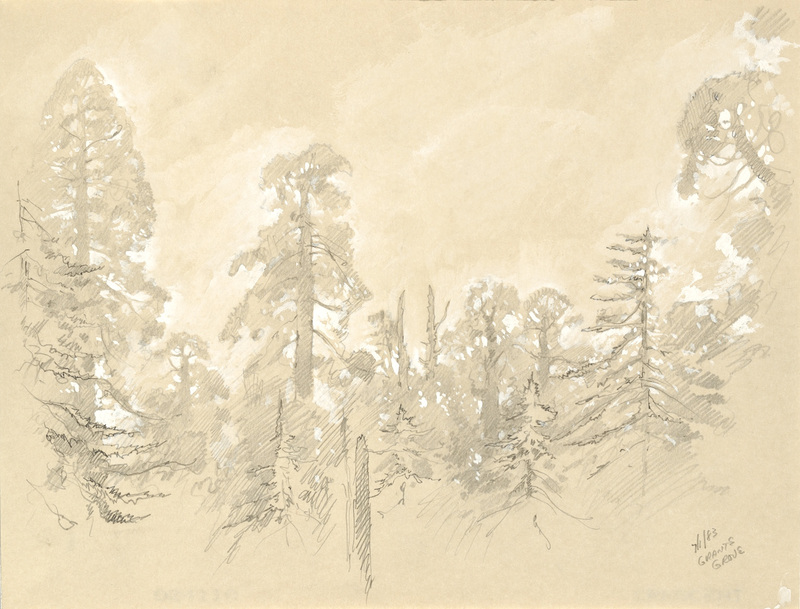 Pencil and white Prisma on toned pastel paper, 8.375 x 10.75 inches, 1983. Sequoia of Lost Creek along the General Highway with motor home. 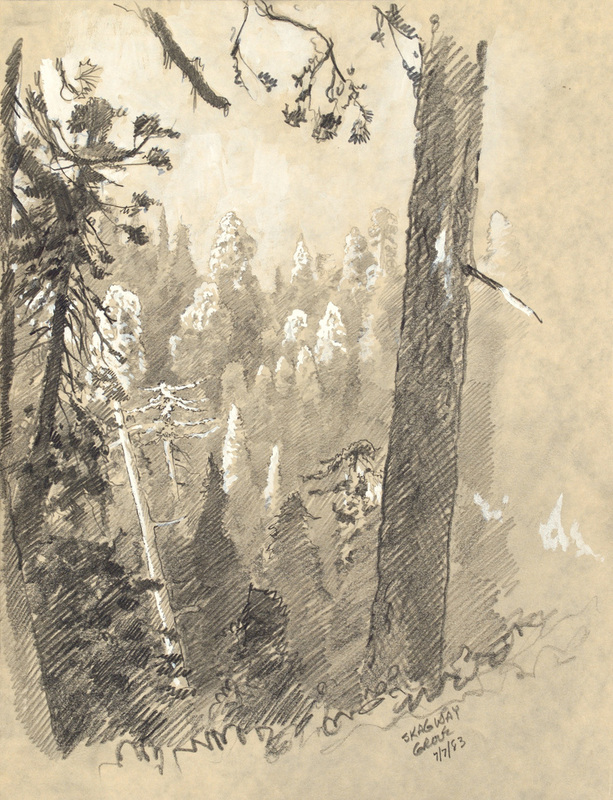 The large sequoia of Muir Grove above bald granite. 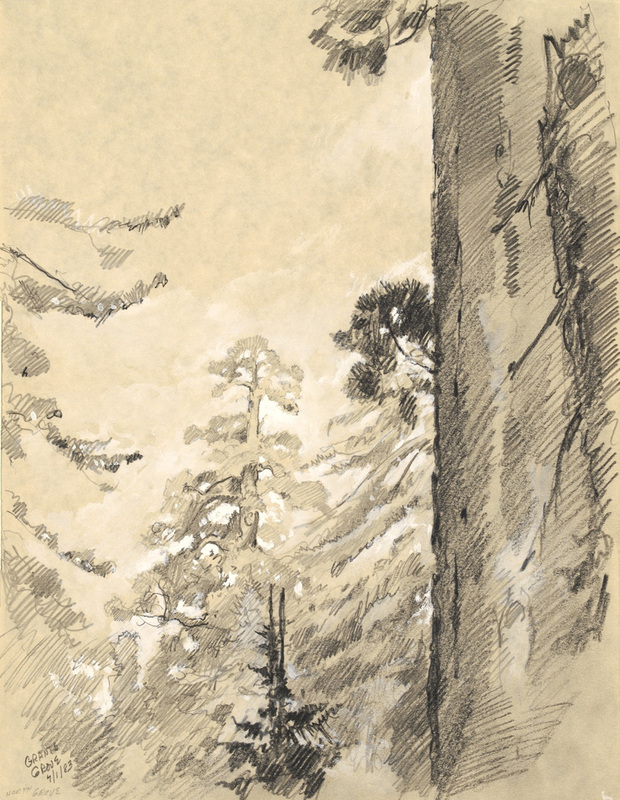 Sequoia within Muir Grove, Sequoia National Park. Pencil, watercolor and white ink on toned calligraphy paper, 8.5 x 11 inches, 1983. Morning light on Skagway Grove along unmaintained Black Oak Trail. Sequoia in Suwanee Grove with Sillman Crest beyond. 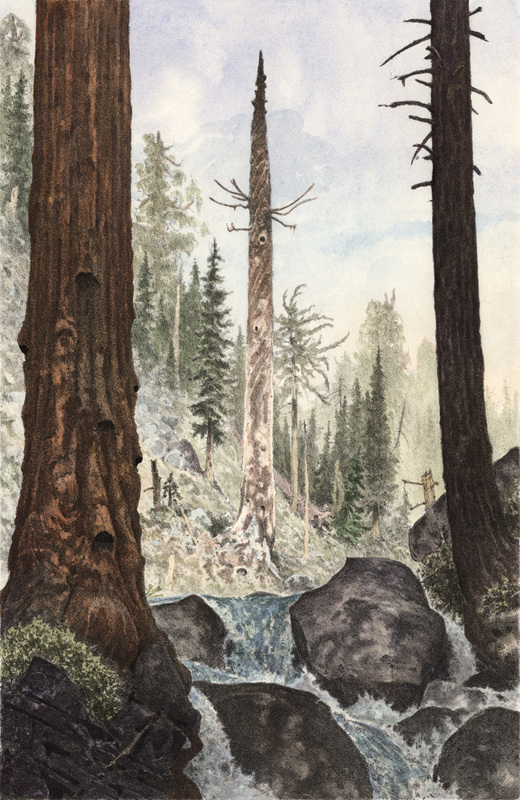 Sequoia in a deep granite gully above the East Fork of the Kaweah River in Sequoia National Park, the last found grove, discovered in 1933. 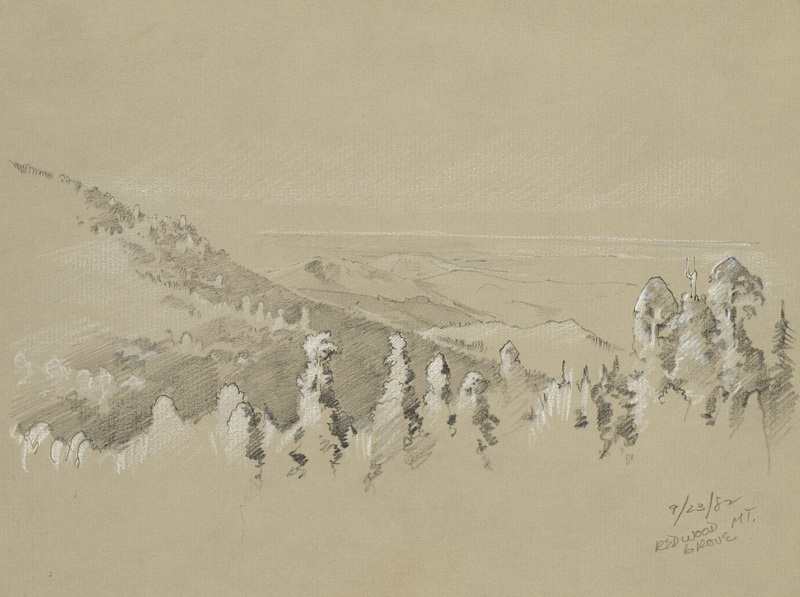 Pencil on cream-toned paper, 8.5 x 10.75 inches, 1983. 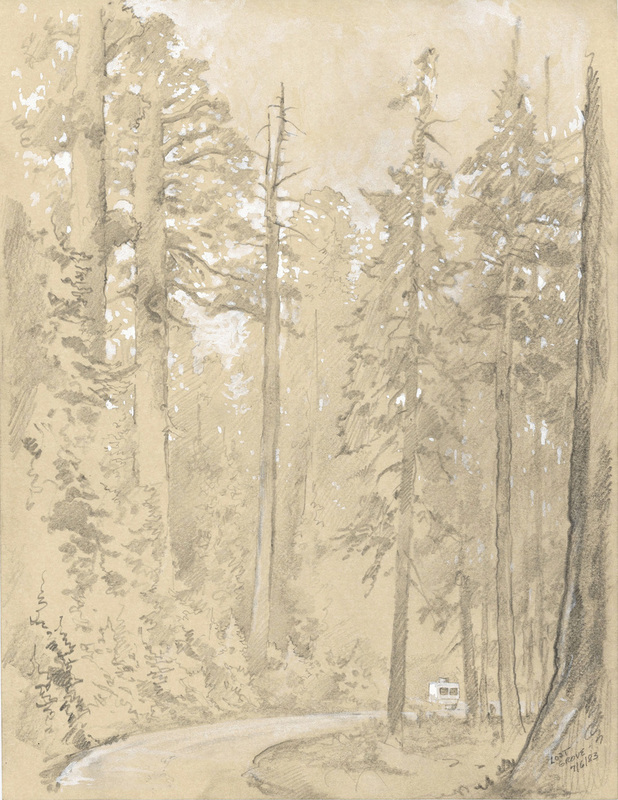 Evening on South Fork Grove, its sequoia spanning the slopes and drainage of the South Fork of the Kaweah River below an unnamed dome in Sequoia National Park. 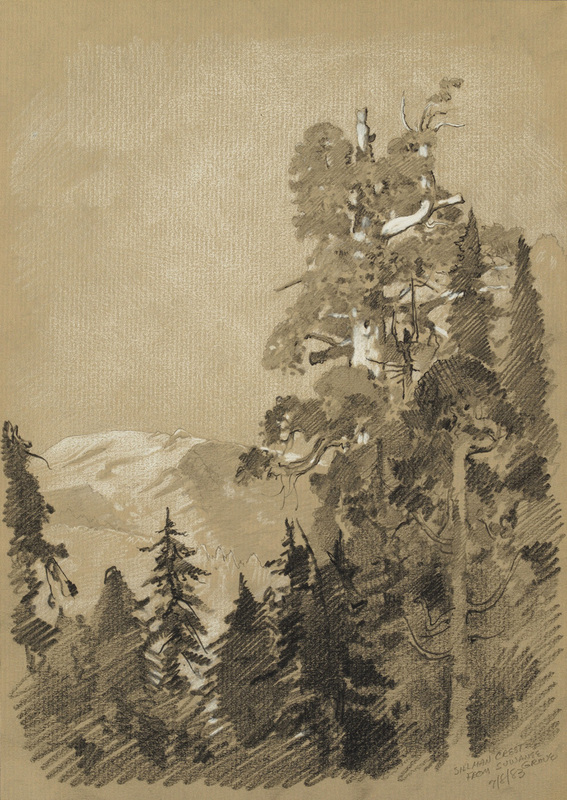 The sequoia of Homers Nose Grove on a steep, descending drainage below the twin domes of Homers Nose. 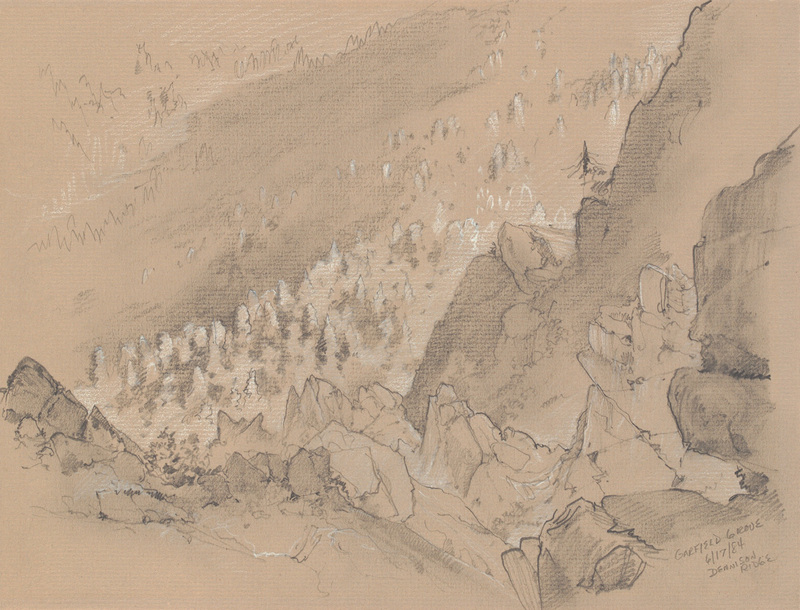 Pencil and white Prisma on toned pastel paper, 8.75 x 11.5 inches, 1983. Leaning sequoia in small Surprise Grove on west ridge of Homers Nose, a place accompanied with thick mats of ladybugs, poison-skinned amphibians and rattlesnakes. 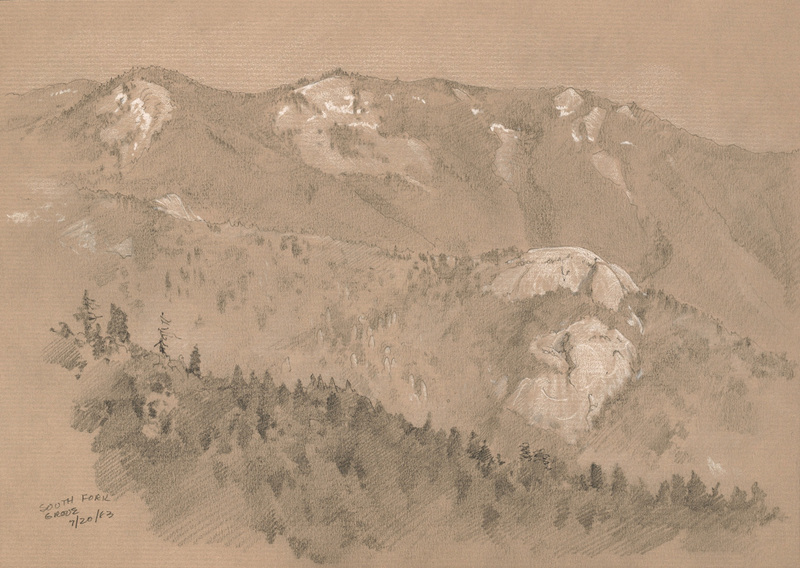 Pencil on cream-toned paper, 9 x 12 inches, 1983. 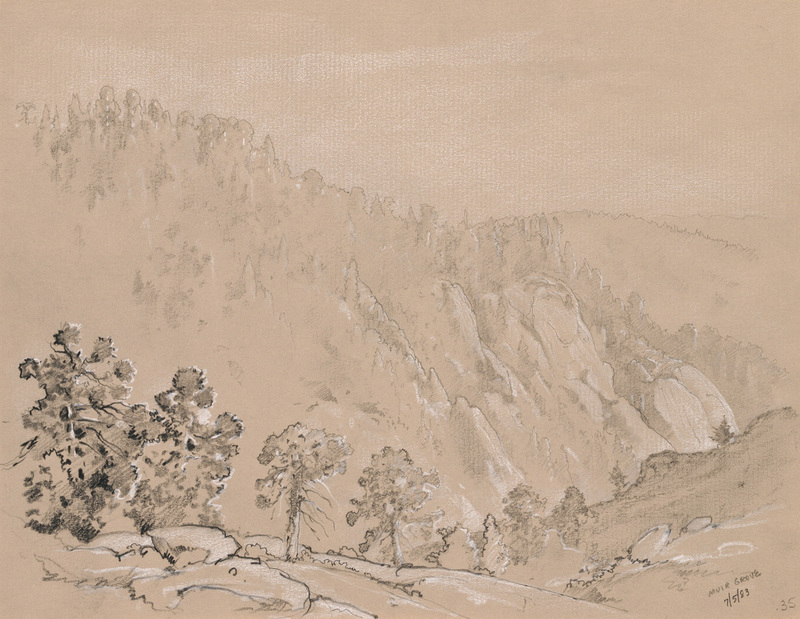 Coffee Pot Canyon Grove, nestled well below the west granite ridge of Homers Nose. Pencil on cream-toned paper, 9 x 9 inches, 1983. Sequoia in Garfield Grove below the ragged granite of Dennison Ridge. 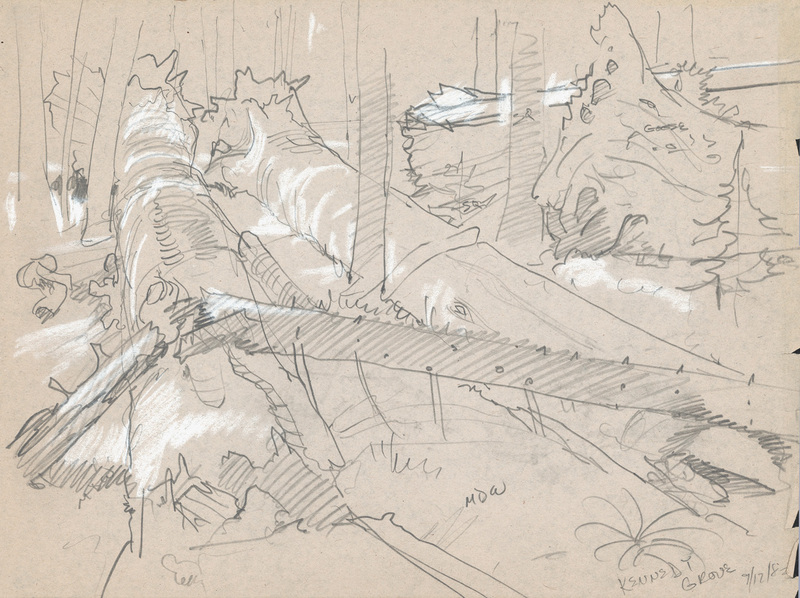 Pencil and white Prisma on toned pastel paper, 8.75 x 11.5 inches, 1984. 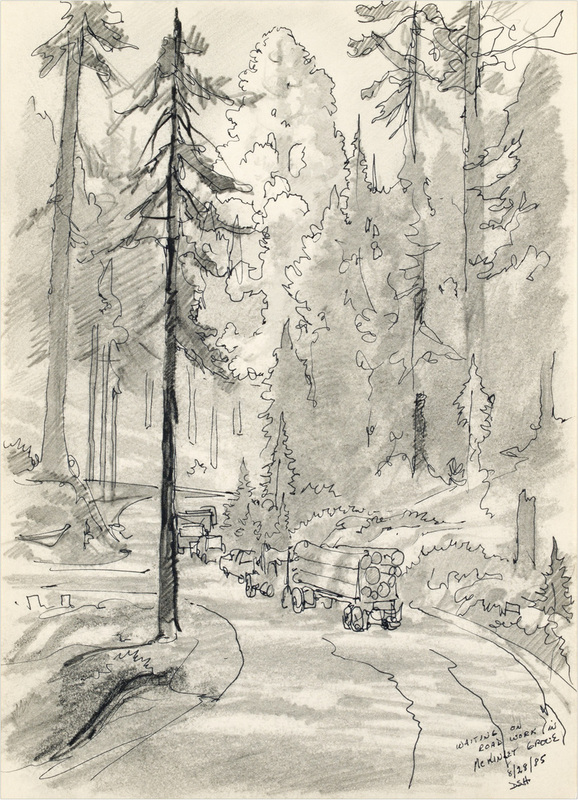 McKinley Grove with roadwork, waiting cars and logging truck. 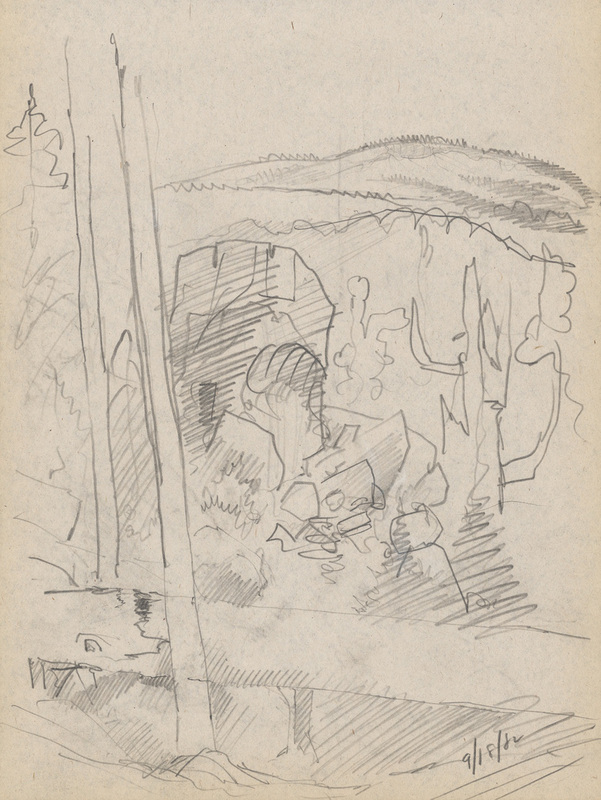 Pencil and felt-tip pen on paper, 7 x 9.75 inches, 1985. Boardcamp Grove below granite ramparts along the eastern ridge of Homers Nose with South Fork Grove beyond and smoke from controlled burn in distant Garfield Grove. 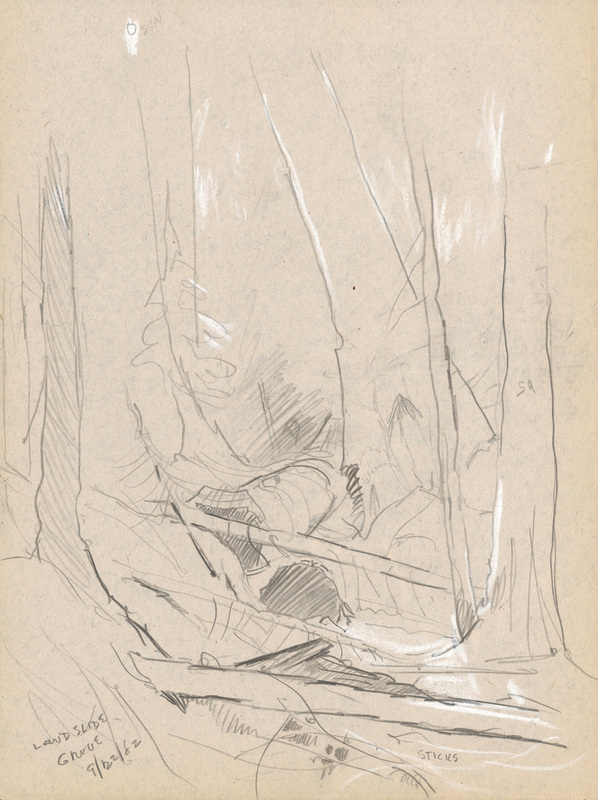 Pencil on paper, 7 x 9.75 inches, 1986. 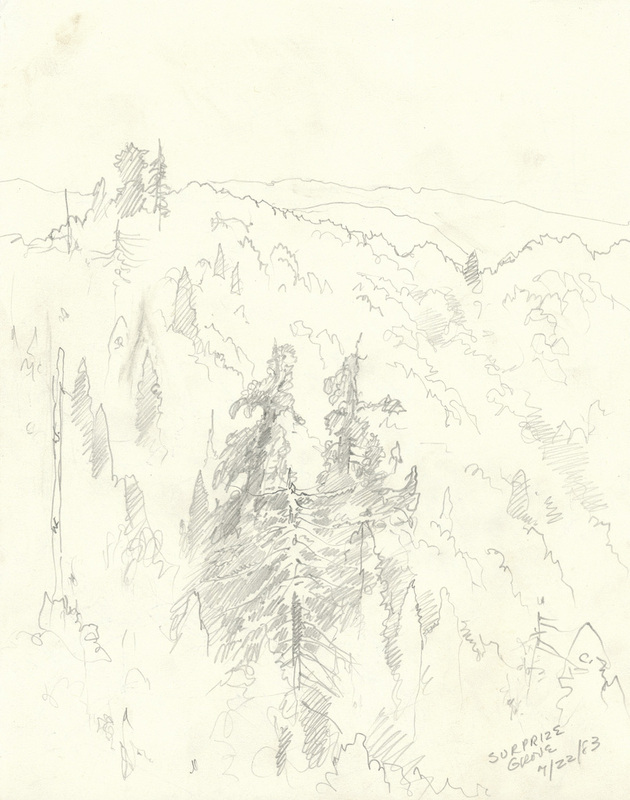 A selection of compositional sketches, drawings and sketch-based finished works gathered as a personal project to hike and draw in as many of the sequoia groves in the western slopes of the Sierra Neveda that I could reach, done between 1980 and 1986. 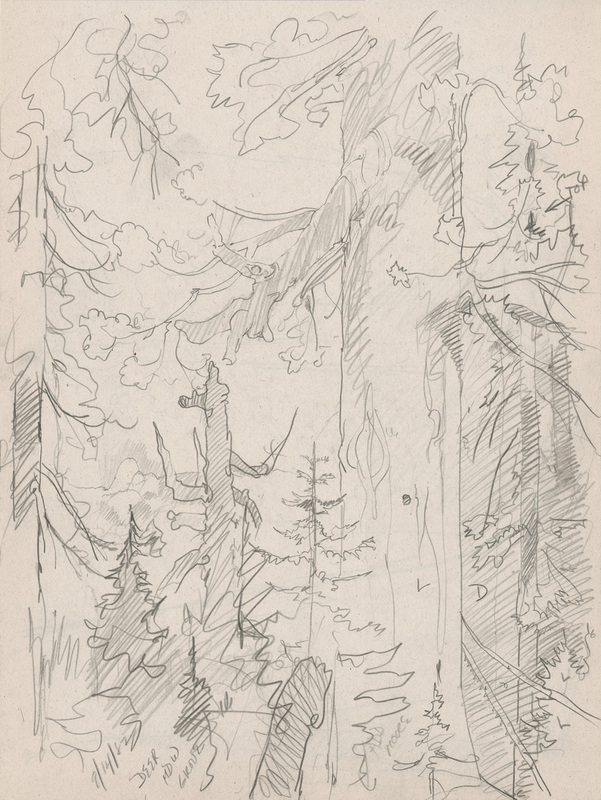 I eventually accumulated 1,000's of sketches and learned some sense of composition in the process--and still fondly recall wandering to these quiet, often little visited places, sleeping night to night in a new grove watching the great trees catch the last day's light and the first light of the next. Perhaps also, I came to feel familiar with some surviving essence of a grand Mesozoic carried into the present.